We here at Celebrity Net Worth released the world's first list of the richest DJs way back on June 6, 2012. Within days of posting that list, it quickly became one of the most popular articles in the history of the site. That's almost exactly three years ago. My oh my, how much has changed in those 36 months. Back then, we placed Tiesto's net worth at $65 million. We placed Calvin Harris' net worth at a relatively meager $13 million. 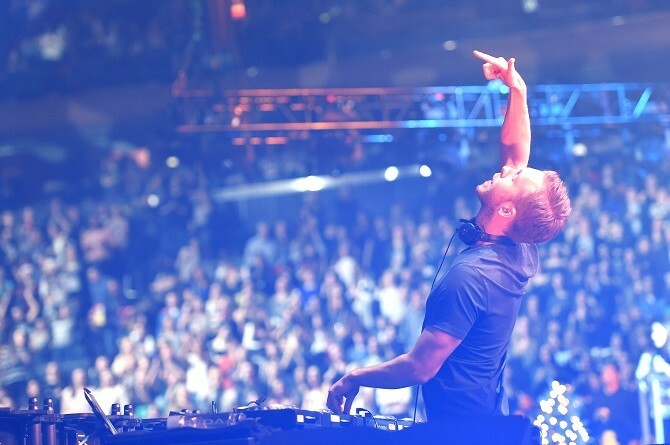 At $13 million, Calvin ranked as the 24th richest DJ in the world. By the way, Calvin's real name is Adam Richard Wiles and before he found success in EDM, he was working as a grocery store clerk. The next four years were VERY good to Mr. Harris. As electronic music took over pop culture in the last few years, the Scottish DJ has seen his annual earnings soar to previously-unimaginable levels. Between March 2012 and 2013, Calvin earned an estimated $46 million. That was enough to make him the highest paid DJ in the world. Between 2013 and 2014, Calvin earned an impressive $60 million. Once again, that was enough to make him the highest paid DJ in the world. Between March 2014 and March 2015, Calvin earned $66 million. Once again, more than enough to make him the highest paid DJ in the world. Calvin earned that fortune by playing approximately 125 live shows and churning out dozens of hit singles. He has a highly lucrative multi-year deal with the second highest grossing nightclub in the world, Hakkasan in Las Vegas. That gig alone pays a reported $15 million per year. Tiesto also has a residency at Hakkasan that reportedly also pays him around $15 million. Tiesto earned less than Calvin in the last 12 months due to the simple fact that he played fewer shows and had fewer radio pop hits. Tiesto earned approximately the same amount of money last year as Avicii and slightly less than David Guetta. All three of the aforementioned artists earned less than half of Calvin Harris' gross. So how has all of this impacted Calvin's net worth? 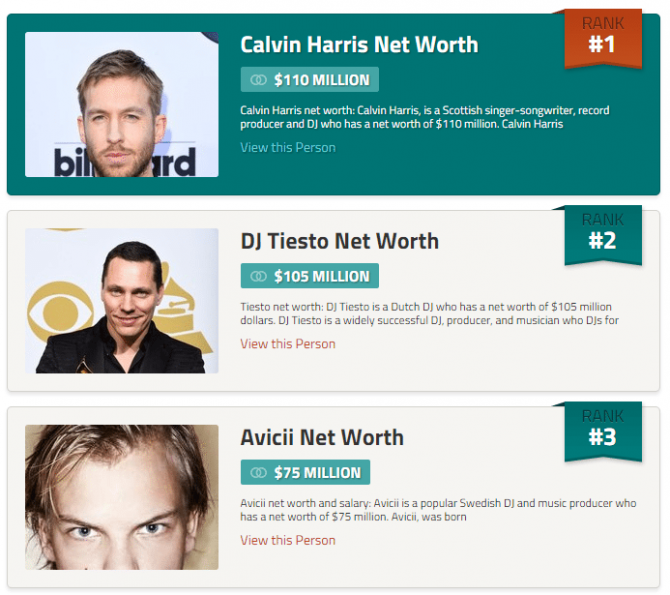 On last year's list of the richest DJs in the world, we pegged Calvin's net worth at $70 million. That was enough to make him the second richest DJ in the world, $20 million shy of Tiesto's $90 million. When you total it all up, between 2014 and 2015, Tiesto's net worth jumped from $90 million to $105 million. In the same time period, Calvin's net worth jumped from $70 million to $110 million. The only bad news I can possibly come up with for Calvin Harris, is that even though his $110 million fortune is impressive, it's still $90 million shy of his reported girlfriend, Taylor Swift. If Taylor Swift somehow stopped earning money altogether, at his current pace, it would still take Calvin over three years to surpass his girlfriend's net worth. Hopefully Taylor doesn't mind slumming with such a scrub! Kidding.